Paris in May: What to See And Do? Words that comes to mind when we think of Paris during the month of May are flourishing and buzzing: the entire city feels a bit like a hyperactive hive of visitors, lush blooms, and excitement. Tourist season is at its peak, and even blase natives start to really see the city again, perhaps inspired by the infectious enthusiasm brought by out-of-towners. If you're looking for a taste of the Paris you've seen portrayed in countless Hollywood films, then visiting at this time of year may be the perfect choice for you. If you dislike crowds and want some of the city to yourself, however, you may want to look into visiting at a quieter time. May is a great time to enjoy the city's many beautiful Paris parks and gardens, read or discuss life's meanderings on a cafe terrace, or do some relaxed, entirely uncommitted window-gazing in Paris' best places to shop. May in Paris is also perfect for exploring the city with someone special, so be sure to check out our guide to the top romantic things to do in Paris. As mentioned, if you like peace and quiet, this may not be the optimal time for a visit. Conditions in museums and even in popular neighborhoods are often quite crowded, and you'll have to compete for entry into some of the city's more coveted attractions and to book restaurants in the best places. For a more low-key experience, consider visiting instead during low season (generally late October through early March). May 19th: Museum Night-- As part of the global event of the same name, a huge number of Parisian museums will open their doors free of charge to visitors until late until the night. Special events and illuminations await in many of Paris' major museums, from the Louvre to the Centre Pompidou. May 25th-28th: Artists' Open House in Belleville Galleries-- This annual event provides an exceptional opportunity to get to know some of Paris' contemporary artists and their work, as well as getting a glimpse of Parisian life from the inside. Nearly 250 artists open their doors to show off their work and spaces, daily from 2:00 pm to 9:00 pm. May 21st-June 10th: The French Open at Roland Garros-- Tennis fans should not miss one of France's most exciting and important tournaments. Tennis greats like Steffi Graf made their debuts at Roland Garros, and the French Open continues to host some of the world's unforgettable matches. If you can't get your hands on tickets, don't despair: Paris City Hall (Metro: Hotel de Ville) often organizes free viewings of the major matches on a giant screen outside. May Weather Outlook-- and How to Pack Your Suitcase? You're likely wondering what the weather's likely to be like in May, and how to pack accordingly to prepare for changing conditions. Look no further-- here's here's the lowdown. How to Pack Your Suitcase? 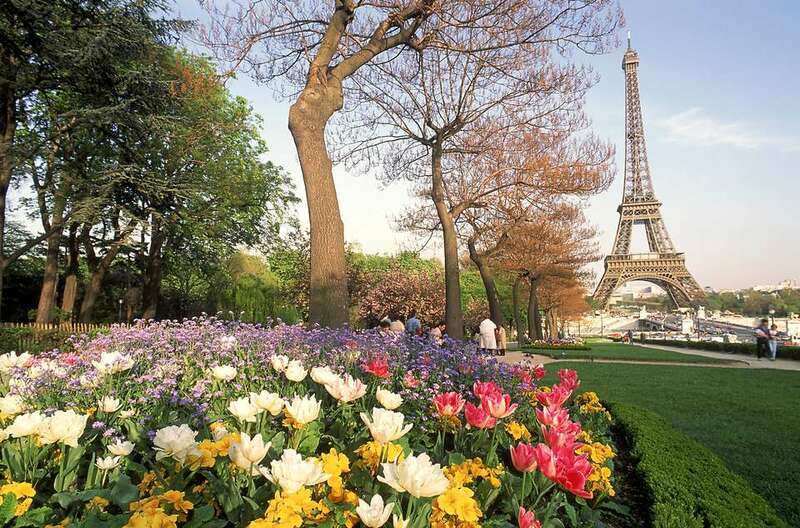 May in the city of light generally has both brisk and warm days, with average temperatures at around 57 degrees F. You might want to pack clothes that you can layer in case an unusually cool or warm day sneaks up on you. Bring light cotton clothes for sunny days, but also pack warm socks and a spring coat. It's not usually excessively wet in May, but sudden thunderstorms are common. Pack an umbrella just in case one of these surprises you during a stroll or picnic. Bring both closed-toe and open-toe shoes, if possible.. On hot days or excursions to the park you'll appreciate the open-toed pair, but you'll need a good, comfortable pair of walking shoes too, especially since visits to Paris usually involve lots of strolling-- not to mention metro stairs. Consider bringing lighter clothes such as t-shirts and skirts for warm weather; you should have ample opportunities to laze around outside, enjoying a spontaneous picnic by the Seine or hopping in a rowboat at the Bois de Boulogne.